Eager for a date to the holiday season "Lover's Ball," school newspaper editor Charlie rigs the school's Secret Santa exchange to woo the boy of her dreams. “My New Crush Gave to Me” would have been much better as a short story. As a book, it’s cute and a quick read, but there is a lot of filler in there. Once it finally picked up around the middle I enjoyed it, though I could never spend much time in real life around the main character, Charlie! 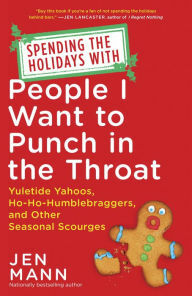 “Spending the Holidays with People I Want to Punch in the Throat” is a memoir in essays about Christmas and other holidays. It will make you laugh, cry, cringe, feel sorry for the author, and ultimately, make you feel nostalgia. Most of the stories had me actually laughing out loud. Some of them made me snort. Quite a few of them left me wondering if we may be related. The point is: We have all been in her shoes, and we have also all been in the shoes of one of the other poor souls. No holiday is perfect, but it’s the funny stories of things gone that leave us longing for more. It’s this very fact that makes the book much more than a collection of funny stories. It has heart, and it is bound to touch the hearts of everyone with a fondness for holidays and families, in spite of all of the hassle they bring.